With over 18 years of experience in the financial services industry, I have been actively engaged in fostering strong client relationships and helping clients achieve their personal financial goals. 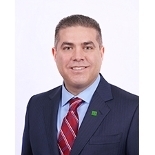 Prior to taking on the role of Financial Planner, I was a Senior Regional Manager for TD Wealth Financial Planning in the Etobicoke and Mississauga markets. I look forward to exploring investment strategies and solutions with you as we work together towards your unique financial goals.